On October 25th, 2018, afterschool programs across the nation joined the Afterschool Alliance in celebration of the 19th annual Lights On Afterschool Day. Lights On Afterschool calls attention to the importance of afterschool programs and the need to keep the lights on and the doors open after the school day ends. In Georgia, nearly 200 afterschool programs registered celebrations. Nationally, a record-breaking 8,400+ programs registered celebrations. For this year’s Lights on Afterschool, GSAN sought to raise awareness of the wide variety of programming offered by afterschool programs using the hashtag #ThisIsAfterschool. To do this, we partnered with several afterschool programs across the state to highlight high demand topics and how afterschool supports youth in each area. Check out our recap blog by clicking here and mark your calendars for Lights on Afterschool 2019 on October 24th. 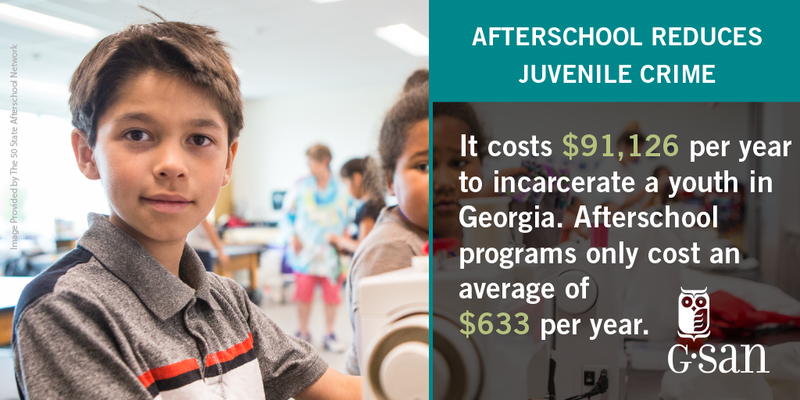 Be sure to check out all of our resources related to the benefits of afterschool on our Why Afterschool Makes “Cents” Home Page. The report looks at key student outcome data and the return on investment of Georgia’s two major funding streams for out-of-school time programs: the 21st Century Community Learning Centers (21st CCLC) Program and the Afterschool Care Program housed at the Georgia Division of Familly and Children Services (DFCS).